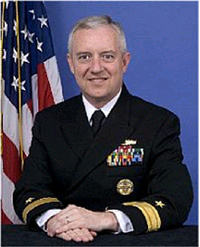 Rear Admiral Titley, a panelist Tueday on national security implications of climate change. With “New Demands on Science and Services” being the theme of this AMS Annual Meeting in Atlanta, it is safe to say that no demand on climate science is more novel and complex than the national security angle of climate change. Strife in Africa is one area, as we mentioned here, but other flash points include the security of borders once covered by glaciers, water scarcity in numerous regions, and the newly navigable Arctic waterways. In an interview on climate change with Armed Services radio, Admiral Titley showed a strikingly forward, mission-oriented viewpoint on the Navy’s interest in climate change, and not just the practical attitude of an officer with a research background.